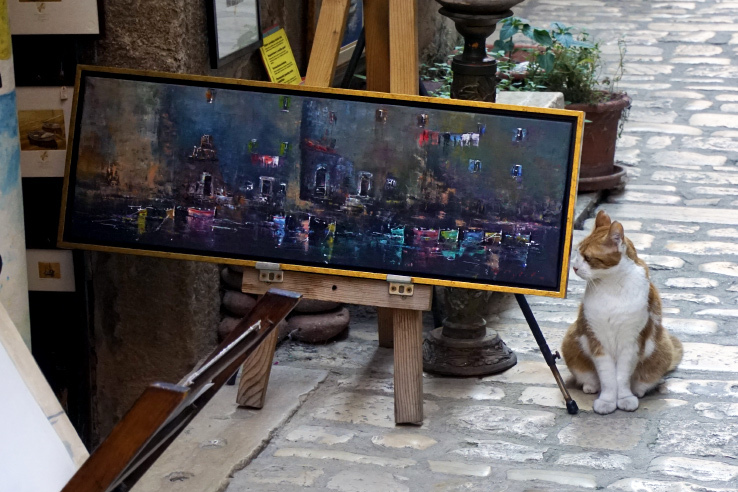 Rovinj is an artist’s world. It’s no wonder this little fishing village inspires creativity and imagination. The streets are painted in the most colorful pastel colors. Laundry hangs from clothing lines, almost as if it was put here strategically. The cobblestone streets are plentiful, narrow and ancient. 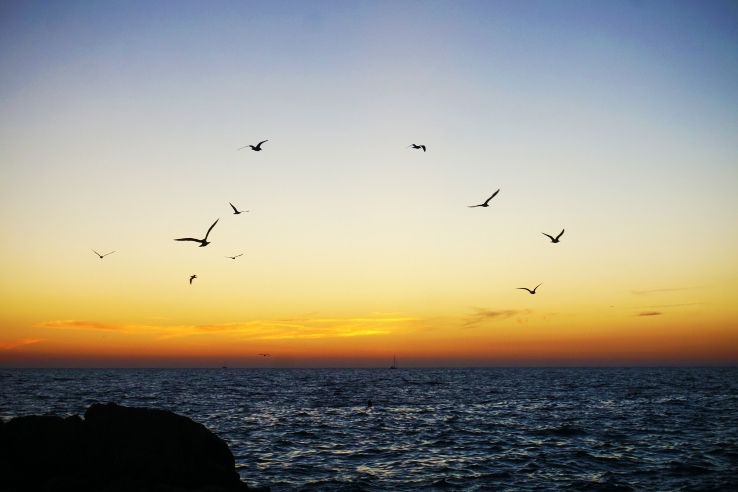 The Mediterranean could not be bluer and its rock beaches cut the waves and provide a perfect place to watch the sunset. It’s the kind of place that makes you feel on top of the world. Like you’re the lucky one since you get to experience it. But for all my shoppers out there, one major thing sticks out about Rovinj, Croatia. And that is its crafts. Since we’ve been there twice now (and purchased quite a bit), we’ve come to discover the best things to buy in Rovinj and exactly where to buy them from. Rovinj = lavender. Since lavender fields are abundant on the Istrian peninsula, it is one of the village’s biggest specialties. And it is absolutely everywhere. If you don’t see it, you will certainly smell it! Throughout the day, lavender fills the air. It’s like the village is constantly relaxing you as you explore it. So as a lover of all things lavender, I was in my happy place. They sell everything from stuffed animals filled with lavender to lavender spray for your pillow and lavender honey. Some shops are more authentic than the others, but you should be able to figure that out. Just know that lavender shouldn’t be super cheap, so anytime you see a ‘deal’ it really might not be the quality deal you’re expecting. If you’re not smelling lavender in Rovinj, you’re smelling truffles, especially at night. It is the tastiest air you will ever smell! And it’s another local specialty in Istria. Whole truffles, shaved truffles, truffle cheese, truffle olive oil. Black truffles, white truffles. Rovinj is a truffle world. They’re sold on every corner and cooked in every restaurant. Not only should you consume as many truffles as you can when you go out to eat, you should also get truffle products to take home. 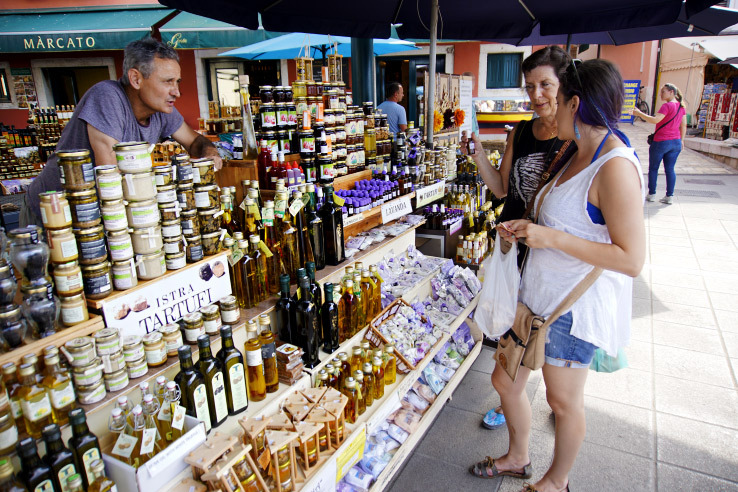 At the daily Green market, close to the center of town, you will find an abundance of truffle products. And you can also find shops throughout the city for all your truffle needs. 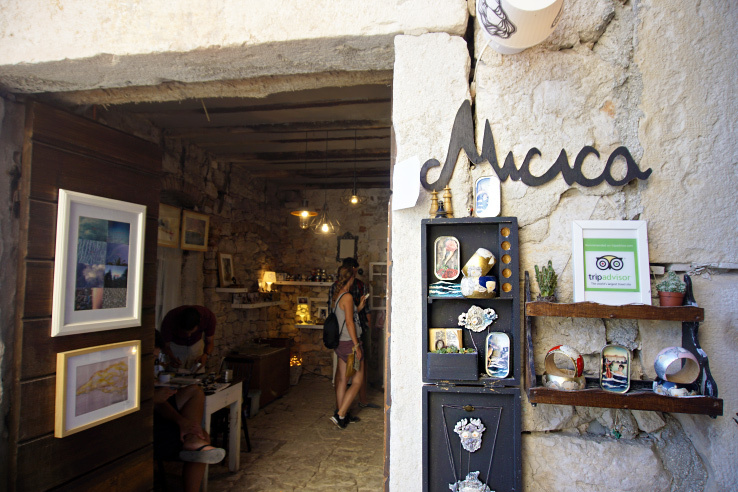 Some of the coolest crafts found in Rovinj are created from what’s washed ashore. Artists use these random and unique items as inspiration to create something beautiful. It can be something simple and classic or something quirky and creative. But they are all truly unique and every item is one of a kind. We found 2 stores that we loved most, which stood out above the rest. One was Tatjana Rokvic’s gallery. Her creations were by far the most clever and inventive, but unfortunately, they were out of our price range. (Trust me, I WISH we could have afforded one!) What she creates is some of the most ingenious use of objects we’ve ever witnessed. Ad Hok Atelier-galerija is another shop that does something similar. And this shop stole our heart, which resulted in an awesome purchase. A simple but perfect picture of a steam boat that we just had to get. Zoran, the artist, creates SO many incredible pieces of artwork. Many made from driftwood and others from things that have washed ashore. 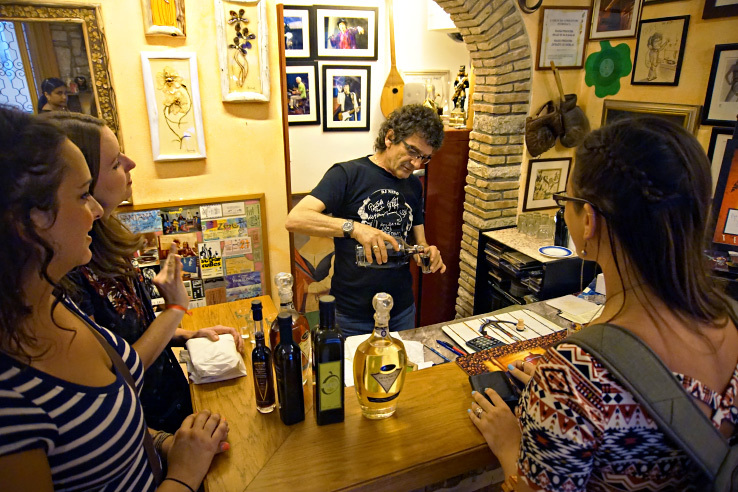 He also has a great apartment that he rents out above his store – CasaProva. 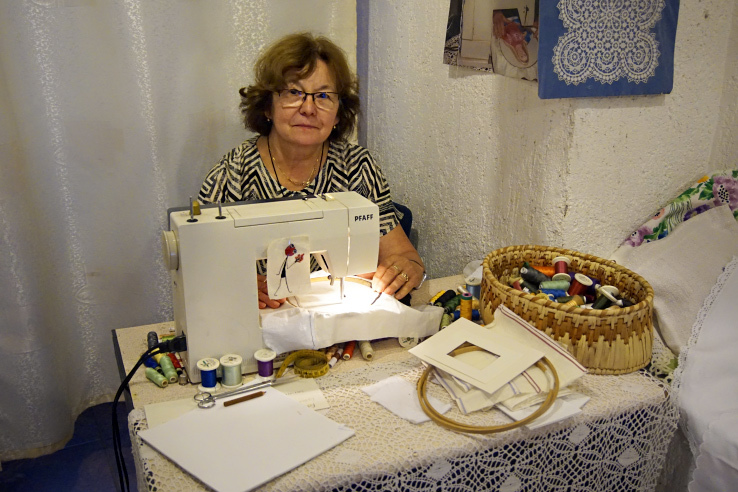 So for crafts and a traditional Croatian apartment in the center of town, Zoran is your man. The theme of these shops: there is no such thing as garbage. 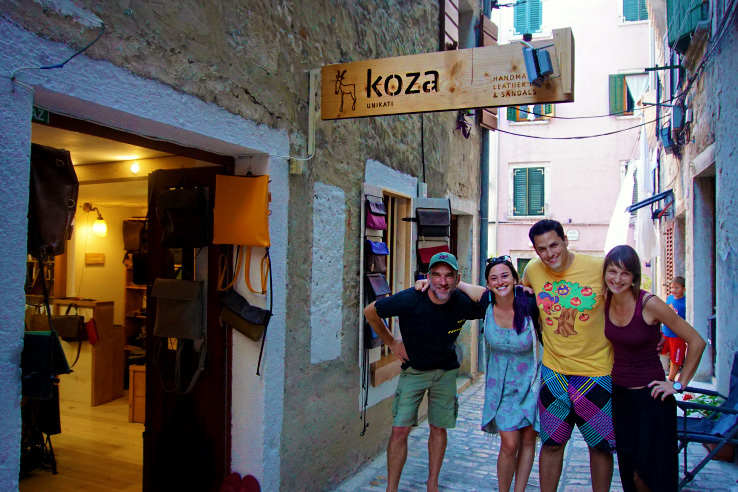 If you find yourself in Rovinj looking for quality, handmade leather products, look no further than Koza. This shop is one of our favorite shops in the entire village. This leather is the real deal. Handcrafted with care by a company who is based out of Zagreb for half the year and Rovinj for 5 months, during the touristy summer months. The leather they use is of the highest quality. You can feel and see the heart that goes into each and every piece. Each bag is named after the lady who created it by hand, which we thought was really special. And they work hard to ensure their quality and positive customer experience is maintained with every transaction. So much so that they don’t even have a website to purchase bags online! You have to come to Rovinj or Zagreb to purchase their leather products. When we asked why they wouldn’t sell from a website, they explained that if the customer buys online, they don’t get to meet every person who purchases a Koza product. How admirable is that?! This is the store you want to splurge on because of the authenticity and the incredible kindness of the people who work there is matched with the quality of their products. We went back to Koza both times we traveled to Rovinj. 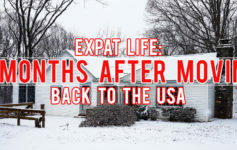 And not only did they remember us, they made us feel like we’d come home. One thing you will find everywhere in Rovinj is driftwood art. What these artists create with driftwood is absolutely awesome. You can find it all. From small things like magnets to larger items to display on a prominent shelf in your house or hang on your wall. Usually, you’ll find the artists creating right in their store as you shop. They paint things on driftwood, use driftwood to model the perfect pastel homes in Rovinj. It’s a unique souvenir from Croatia and can prove to be the perfect piece to bring home and remember your trip. More of a jewelry person? Well, Rovinj has got you covered. Throughout the city, you will find both red and blue coral everything! Necklaces, bracelets, rings, earrings galore. 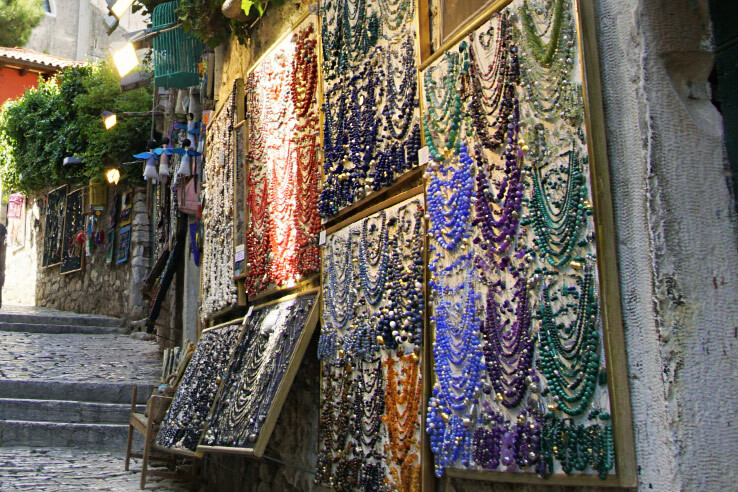 Many shops along La Grisia sell coral, so you definitely will not have a hard time finding the perfect piece. We’ve seen both raw coral and polished coral beads. Personally, I loved the raw coral. It seemed unique and more interesting than the polished. 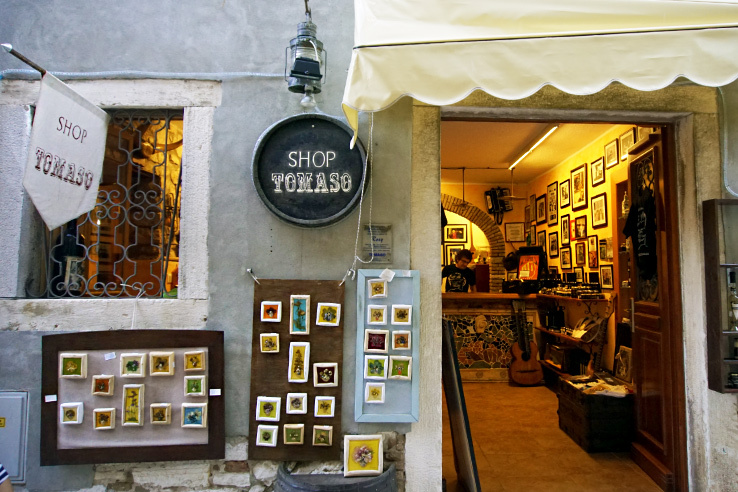 Olge’s gallery in Rovinj on the main shopping street of La Grisia is truly something to see. She creates the most beautiful framed masterpieces, sewn in silk on canvases. Fully detailed, intricate and colorful. The closer you look, the more you’ll be in awe. It is clear that her work requires an immense amount of skill and patience. And usually she is working on something in the gallery, so you can admire her genius. To top it off, she is the sweetest lady with a true passion for what she does. We invested in something for ourselves, of course! Secondly, the owner is one of the coolest guys to lose track of time talking to. He has some great stories of when he used to follow bands around in the 70s. His wall is covered with pictures of him with famous musicians, and he’s always got great music on. And lastly, craft-related of course, Tomaso also sells framed wildflower bouquets that are beyond awesome. He works with a local artist who creates these framed 3-d wildflowers covered with polyurethane. She makes the frame and uses the flowers to create mini bouquets inside. Usually, you see dried flowers flattened and framed, but these have so much dimension. And they are the perfect size for packing. 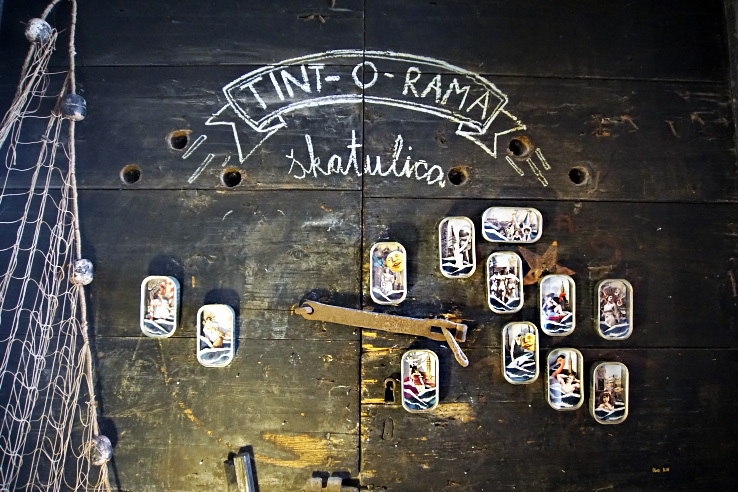 Some of the most out of the box and original crafts in Rovinj can be found in sardine cans at the Micaca Atelier gallery. This artist strategically and cleverly cuts out pictures to create scenes inside a sardine can, kind of like a mini shadow box. It’s SO cool and guaranteed to be different than anything you’ve ever seen. He also sells jewelry and other artwork, but these sardine cans were our absolute favorite. 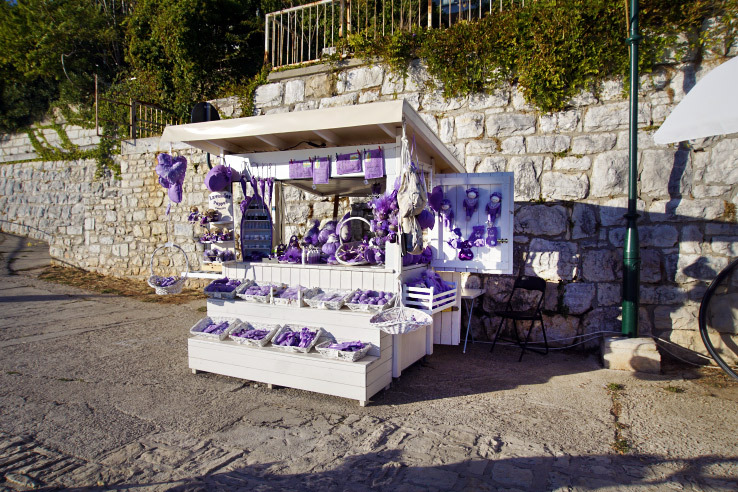 If you’re a true craft lover, plan your visit around the Grisia Open-Air Art Exhibition, which takes place annually, during the 2nd Sunday in August. 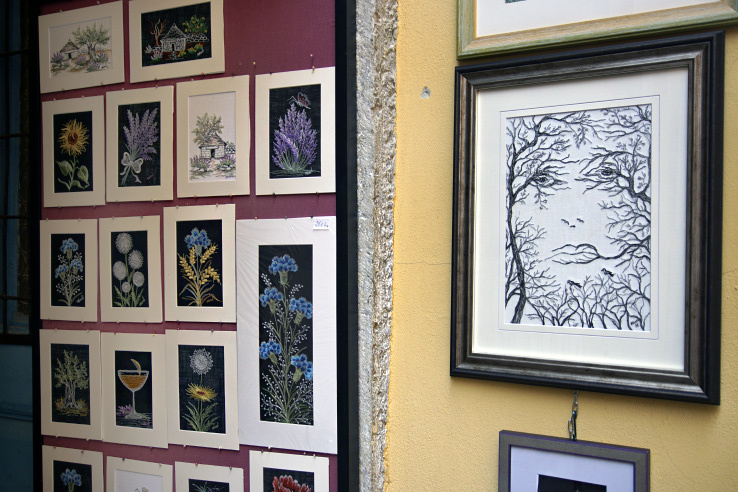 Here you will find even more craft vendors with artwork hanging on ancient homes in the Old Town. 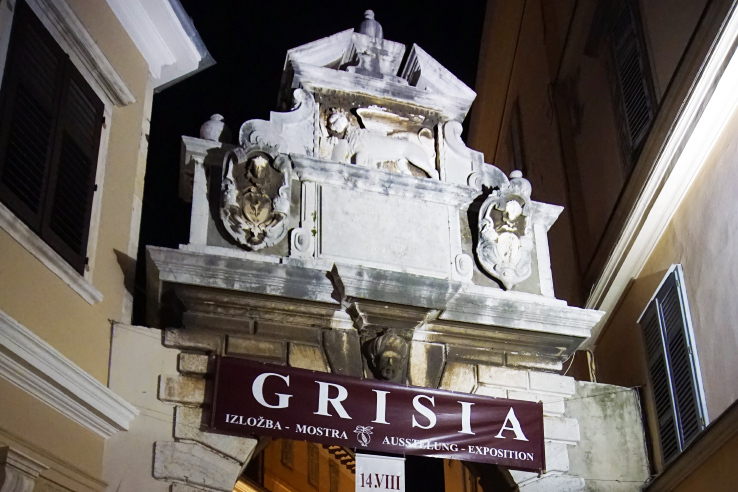 Grisia Street basically transforms into an exhibition in the open and attracts the best art galleries and studios. 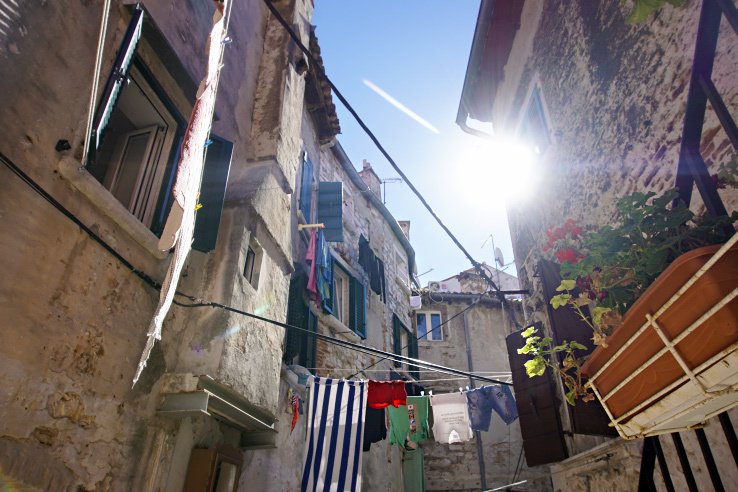 The first time we visited Rovinj, we were lucky enough to be there for this annual event. And as 2 avid lovers of crafts and souvenirs from our travels, we were seriously in craft heaven. 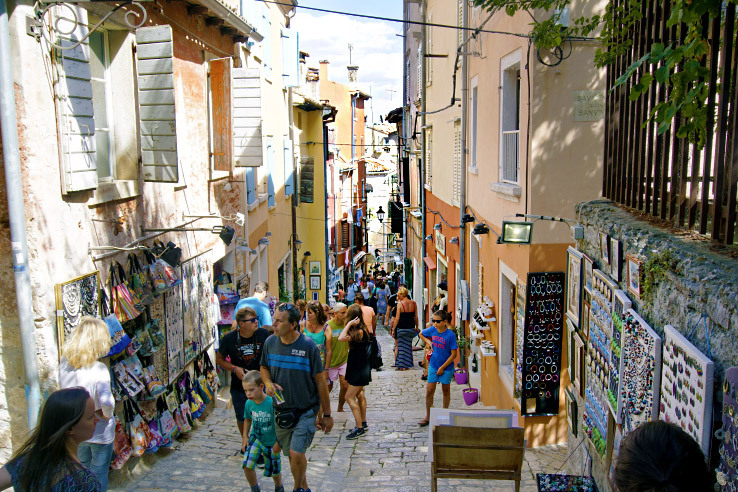 Clearly, from this list, you can tell that Rovinj is an artists’ paradise and a paradise for those who appreciate art. Because of that, there are few ‘cheap’ souvenir shops. 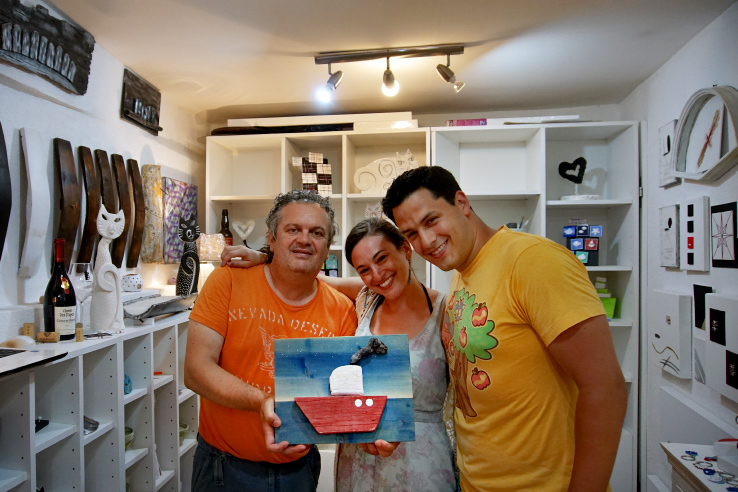 Of course, you will come across manufactured crafts and souvenirs from Croatia, just like any popular vacation spot. But the cheap stuff is easy to point out and not as common as we’ve seen in other summer destinations. Just take a stroll down La Grisia to discover what feels like a street full of beautiful things. You know you’re purchasing something special because most of the artists are in their galleries creating as you shop. And what better way to spend your travel dollars than supporting a passionate and creative person? It is 100% one of our favorite parts about traveling. To meet the creative minds behind each work of art. Listen to their story and create a story of your own with the inspiring interactions you have. That is priceless. 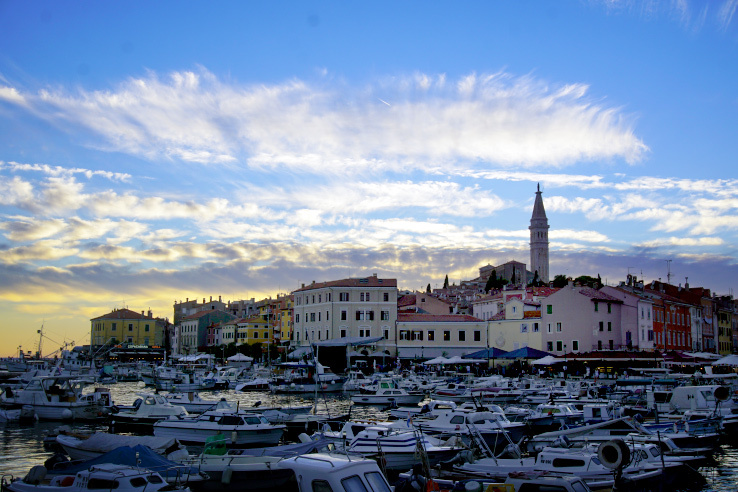 And after you witness the scenery, the smells, and the sites, it will be no surprise that this picture perfect village on the Mediterranean is home to some of the most magnificent souvenirs from Croatia.